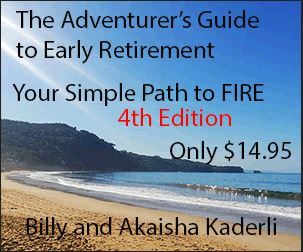 Sometimes, even though we live a fabulous retirement lifestyle, we like to break up our routine and shoot off to a beach or take a vacation for a few days. 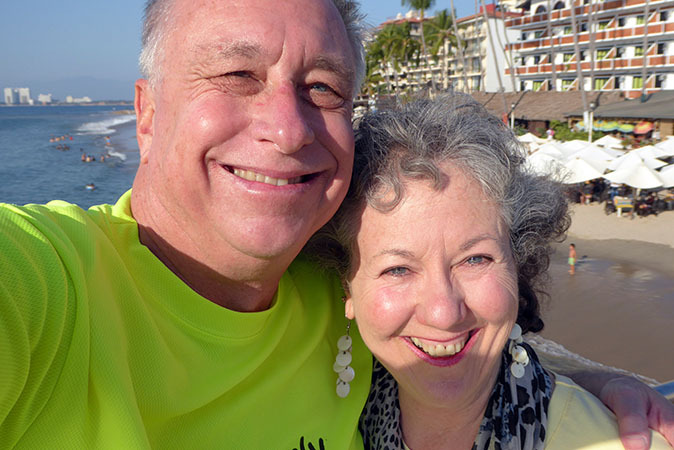 Billy found a great air fare deal, $50 USD one way per person on Viva Aerobus (from Guadalajara) and he paired that with a super hotel just minutes walk to the beach. 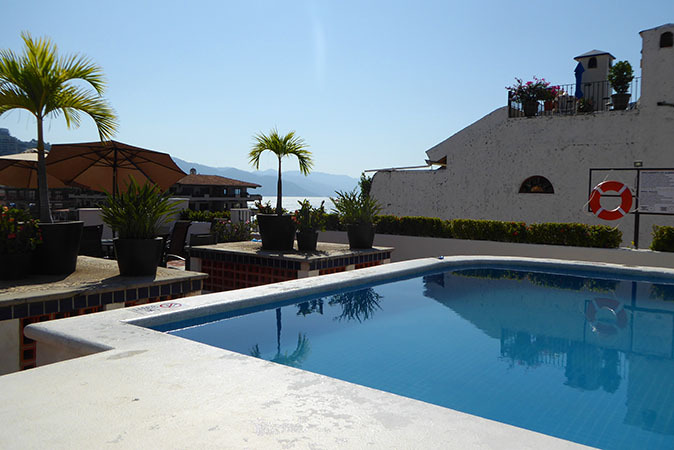 Check out our pictorial of Puerto Vallarta below. Billy has itchy feet and he scans air fares online to catch any deals. It had been a while since we spent time at a beach, and when Viva Aerobus offered one way tickets for $50 USD per person, he scooped them up! The flight was less than an hour, Guadalajara to Puerto Vallarta. 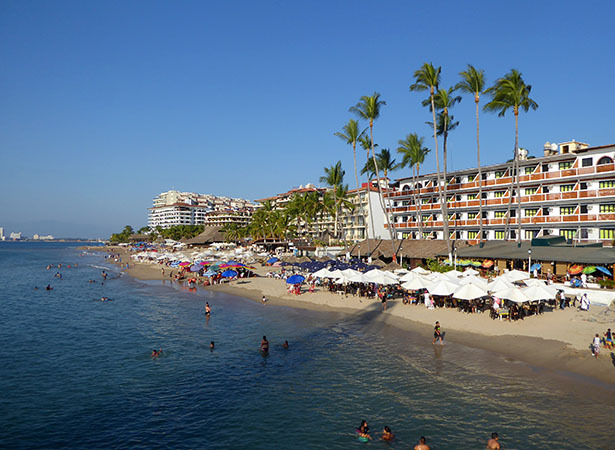 Puerto Vallarta is a beach we had seen several times in previous years when we lived in Mexico. It was time to return! 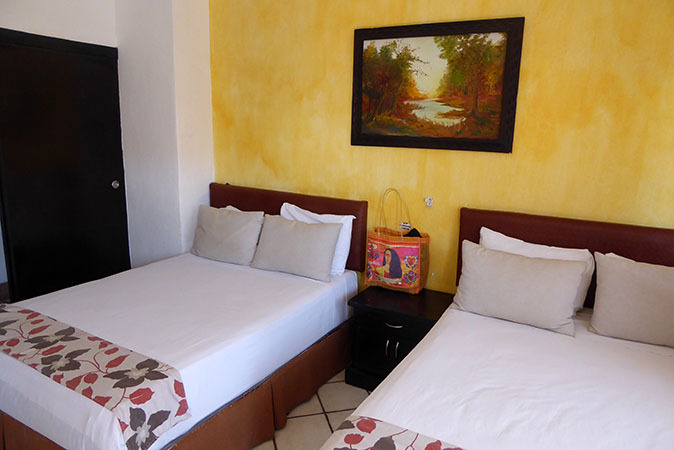 Eloisa hotel, located in the Zona Romantica, is just a few minutes walk to the beach. We had an air conditioned balcony room with a view of the ocean and the plaza below. For anyone who might want to take a break from the crowds or from salt water, there is a swimming pool on the top floor. Potted plants were placed decoratively, and of course, there was a view of the ocean below. 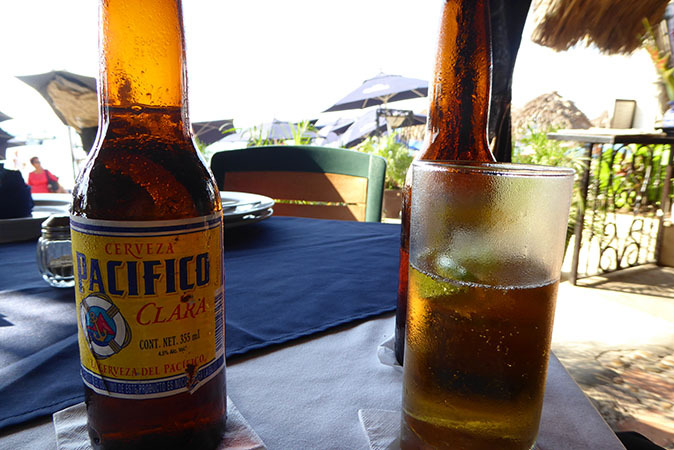 As soon as we could, we dashed off to the beach to put our toes in the sand, and to enjoy a Pacifico with a squeeze of lime. 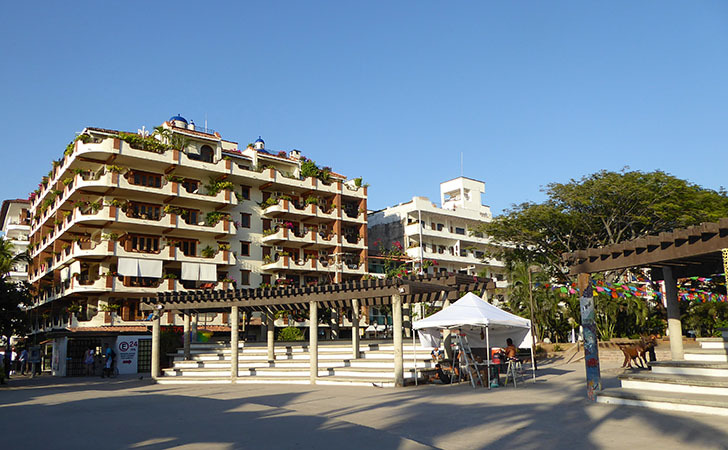 Hotels and restaurants line the beach at PV. 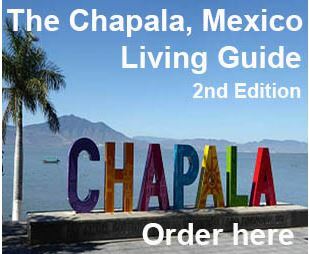 You can have your choice of little dives or upscale dineries. We came for the seafood and were not disappointed! The weather was perfect. There was little humidity, a nice sea breeze and temperatures were in the low 80s. It just all felt so good! These skewers with mahi-mahi or shrimp are a favorite. Freshly grilled over a carbon flame, the juice of a lime picks up the flavor. Each stick costs less than $2USD. 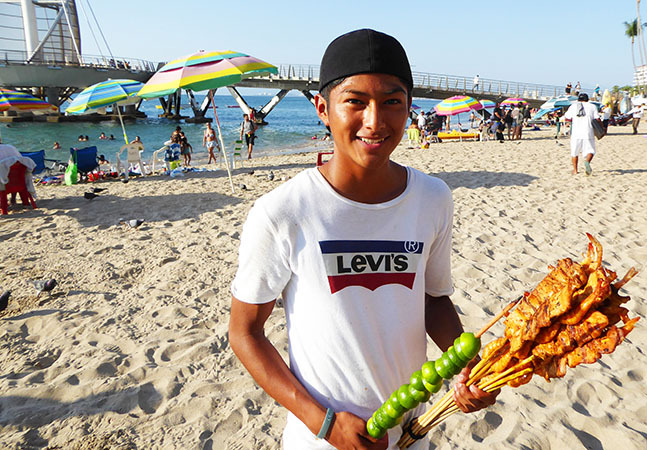 Independent vendors walk the beach selling these skewers, freshly shucked oysters on the half-shell, fresh fruit, nuts, and a variety of other foods and drinks. In the background, you can see the walkway where we were previously. It's a nice way to view the shore, all the umbrellas, the lights from the restaurants at night or to enjoy a sunset over the sea. You can see our hotel in this photo. 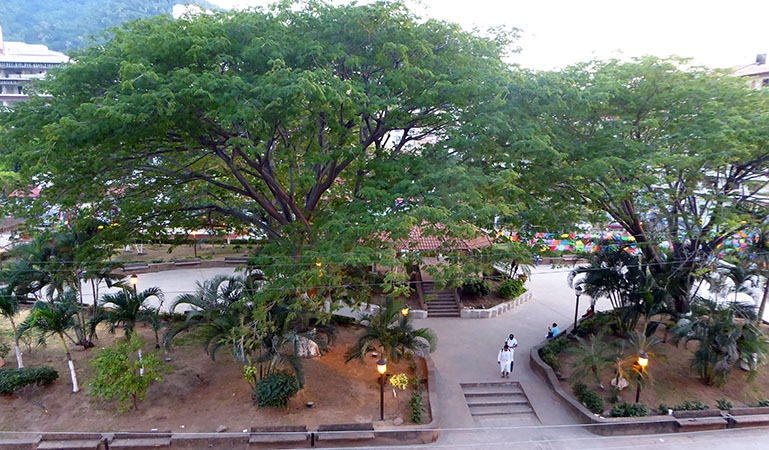 It's the white building in the center. Down below, under the tent, were artists working on very modern and eye-catching mosaics. They were quite skilled and their work was impressive. Several of the posts had already been finished (you can see one on the right of the white tent), and in this photo, the artists were working on a small wall. They continued working the whole time we were there, doing posts, walls and generally livening up the Plaza area. In the mornings, at the reasonable hour of 8:30 a.m., people would gather and do exercises to music. It was really wonderful to see this happening. It seemed like a nice, social group and a great way to get one's morning started. Grab a coffee or a Green Juice and hit the Plaza! Our first evening we went to a beachside restaurant (more toes in the sand) to get some seafood. Here was a small band playing music. 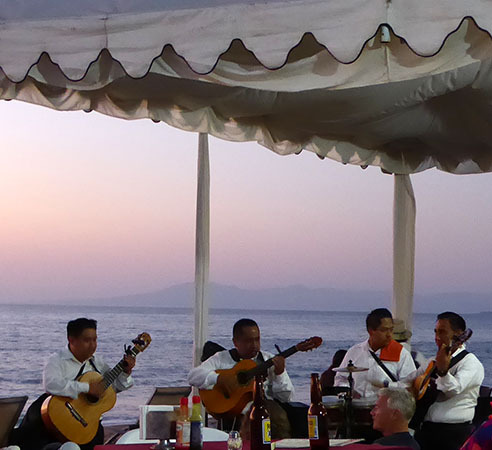 Every day we were in Puerto Vallarta, there were bands of various sizes playing all styles of music - Classical Mexican ballads, Reggae, and Jazz. 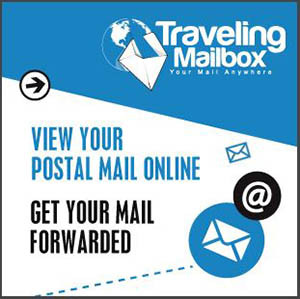 To listen to some captivating live music, click on this short VIDEO here. Seriously. 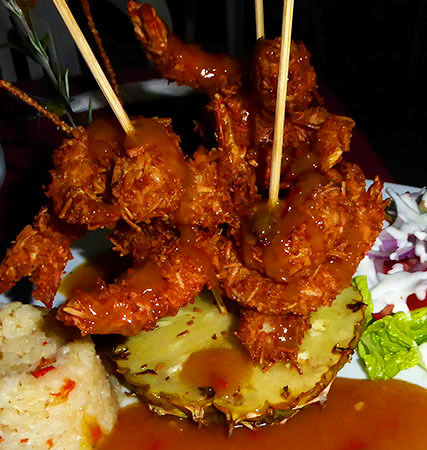 This was the best coconut shrimp we ever had. Piled high were coconut battered shrimp fried to perfection. Fresh, sweet pineapple underneath and served with a flavorful sweet sauce, this dish came with a small salad and rice for a little over $10USD. 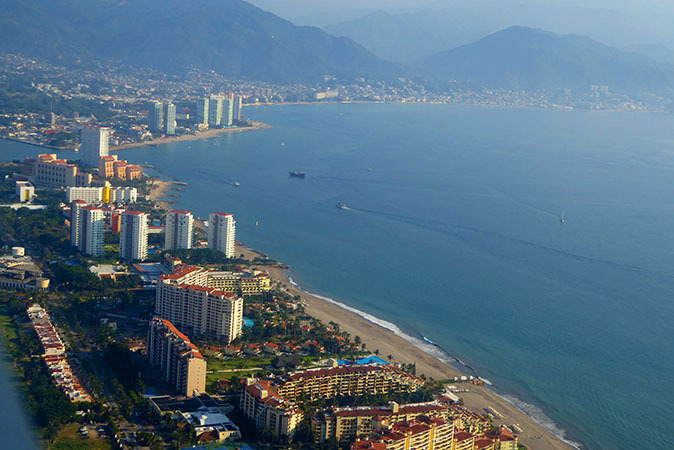 If you have never been to Puerto Vallarta, make it a point to go. We think you'll enjoy it.